After months of teasing and torture, the Windows 8.1 Developer Preview is finally here, ready to deliver us from many of Windows 8’s glaring flaws. You’ve no doubt already heard about Windows 8.1’s biggest new features: The Start button is back, Bing owns the Search charm, the split-screen Snap feature is customizable, yada yada yada. You know the drill. What hasn’t been talked about much are the subtler changes—the hidden secrets tucked away in the dark corners of Windows 8.1, whispering and waiting for a turn to shine rather than shouting their proverbial presence from the proverbial rooftops. No, these gems aren’t as flashy as Windows 8’s newfound ability to sync apps and Internet Explorer 11 tabs across multiple devices, but they’re arguably just as (if not more) handy. And there’s no way you’ll find them unless you dig deep…or read this enlightening guide. Let’s start with something basic, but far from obvious. Yes, the Start button is back…but the Start menu isn’t. 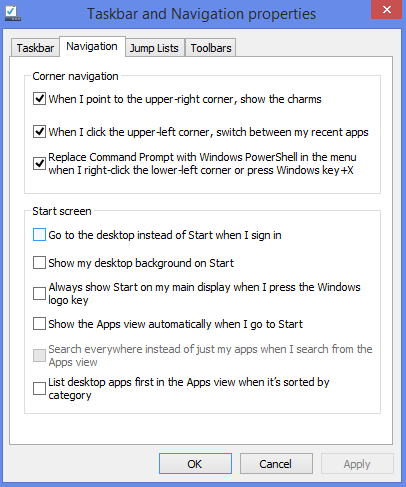 So you still need to swipe through a multiclick process involving the charm bar if you want to shut down your PC—if you don’t know about the Start button’s secret menu, that is. Right-clicking the Start button that appears when you hover your mouse cursor in the lower-left corner of the screen brings up a bevy of powerful options, including quick links to deep stuff like Disk Management and Command Prompt tools. Now, the menu itself isn’t new to Windows 8.1. What is new is the addition of a Shut Down option to said menu. 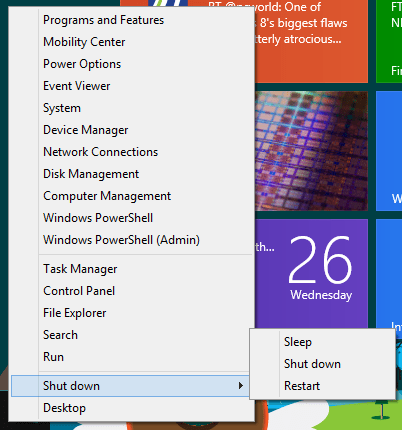 Hovering over it for a second gives you options to shut down or restart your PC right then and there, no fiddling with hidden menus required. The Taskbar Properties option is another old friend with a subtle new look—and a crucial one for desktop diehards. Did you hear that Windows 8.1 lets you boot directly to the desktop on start up? It does, but Microsoft clearly doesn’t really want you to do it, since the option is buried in this obscure corner of the OS. Head to the desktop, right-click the taskbar, select Properties, and then open the brand-spankin’-new Navigation tab. There, you’ll find new options for disabling the uppermost hot corners. Those options are also available in the modern-style PC Settings, but many Start screen options can only be found here. While you’re busy taking advantage of all the hot resizable Snap size action in Windows 8.1, don’t forget that you can now have a single app open in multiple Snapped windows—something you couldn’t do in the original Windows 8 release. Despite a lot of effort, I haven’t been very successful in getting that feature to function in the Windows 8.1 Developer Preview. Trying to open an app twice—or Snapping an app to one side of the screen and attempting to open a second instance—simply doesn’t work. 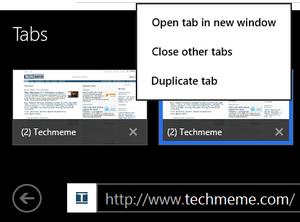 You can open multiple instances of the modern version of Internet Explorer 11, though. 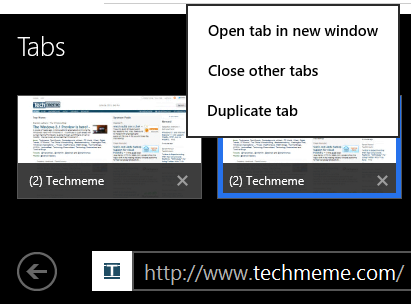 If you have multiple tabs open, you can long-press one of them and select Open tab in new window in the resulting pop-up box. Alternatively, long-pressing a link on a webpage brings up several options at the bottom of the screen, including that ‘Open tab in a new window’ dialog. Selecting that option causes the page to appear in another IE 11 window, and Windows 8.1 helpfully Snaps both windows into a 50/50 split. SkyDrive takes on a much bigger role in Windows 8.1, driving Microsoft’s vision of a seamless, cloud-connected world even further. In fact, SkyDrive is so vital an underpinning to Windows 8.1 that Microsoft dedicates an entire section to it in the modern-style PC Settings. A vast number of settings now sync and follow you from device to device by default—including modern apps, woohoo! But if you really want to live in the cloud, you’ll need to enable some options buried three or four levels down. Open the charm bar, and select Settings > Change PC Settings. 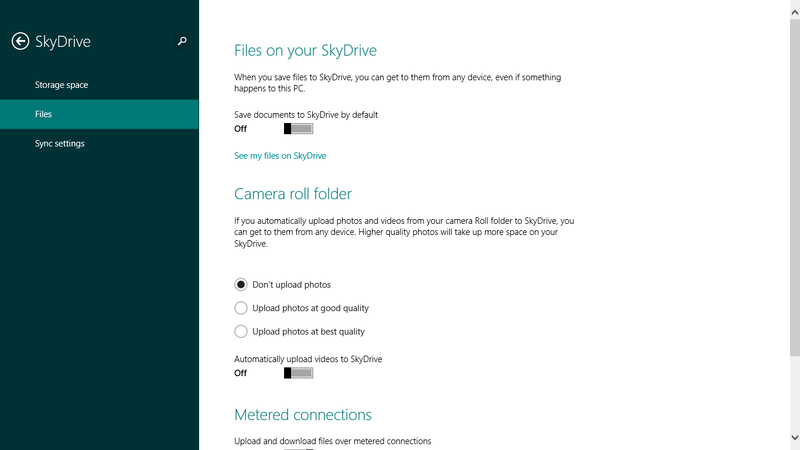 From there, open the SkyDrive options and select Files in the left-hand menu bar. 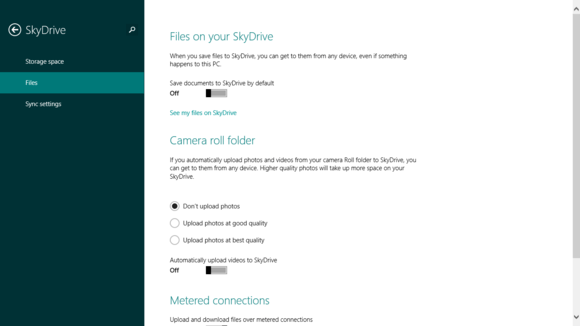 Here you can acquire the ability to save documents and snapshots from your Camera Roll folder to SkyDrive by default, a downright awesome new option if you want to be able to sit down at virtually any Windows 8 computer and have it feel like your own. Relaxing ain’t easy if your gadget blasts alarms throughout the day. Windows 8 has joined Apple and Android in embracing notifications, which make sounds and light up your lock screen even if you’re not holding your tablet in your hand. Fortunately, Windows 8.1 lets you silence the cacophony with its new Quiet Hours setting. This one’s buried, too. 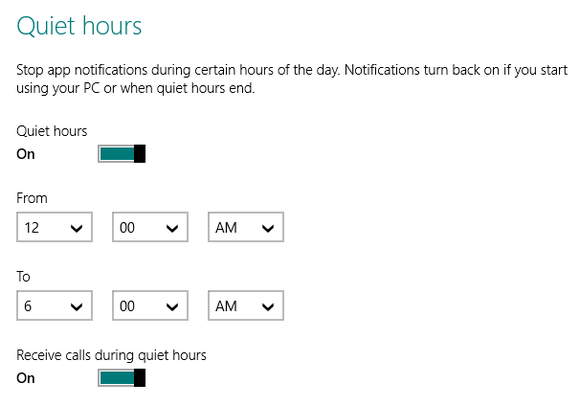 Open the Settings charm, and navigate to Change PC Settings > Search and apps > Notifications. 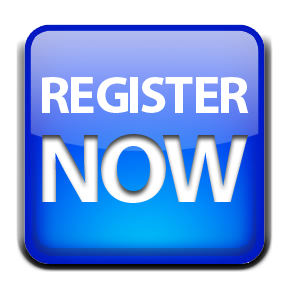 Scroll down the page a bit until you reach Quiet Hours. By default, Windows 8.1 is set to go silent from midnight to 6 a.m., but you can change the window to any time frame you desire. 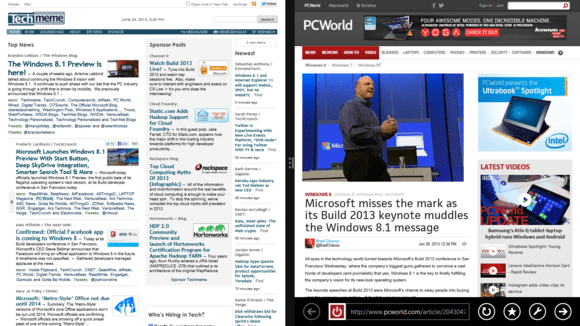 Something really irked me about the modern apps in the vanilla version of Windows 8. No, I’m not talking about their seas of wasted space (Windows 8.1 didn’t fix that!). I mean the fact that they were incredibly pesky to manage from anywhere except the Start screen. Modern apps don’t show up anywhere obvious in the desktop File Explorer’s folder structure, and you can’t eliminate them from the Control Panel’s Programs & Features interface, either. Bleh. Windows 8.1 changes that. Huzzah! Navigate to the Search & Apps section once again, and select App sizes in the left-hand menu. 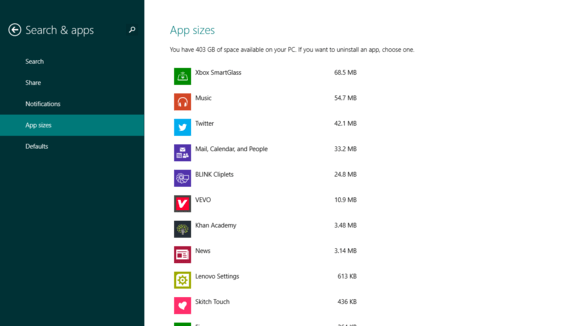 The screen populates with a full listing of all your installed modern apps, complete with the file size of each app. If you’re looking to free up some hard drive space, you can click an app to bring up an uninstall option. People don’t likes wires, and neither does Windows 8.1. Like Android 4.2, Microsoft’s OS update includes full support for the fledgling Miracast wireless display standard, which basically acts like Apple’s AirPlay technology. It’s your PC screen, beamed to your TV or monitor as if by telecommunications magic! Miracast is so new that you might have trouble finding compatible television sets at stores near you, but you can pick up Miracast receiver dongles that transform any TV with an HDMI port into a Miracast-compatible display. Even better, when Microsoft’s Xbox One console lands in time for the holidays, it’ll be a fully capable Miracast receiver, further deepening the synergies between Windows 8 and Xbox. If you want to connect your Windows 8.1 device to a Miracast receiver, you can dig deep into the modern-style PC Settings. 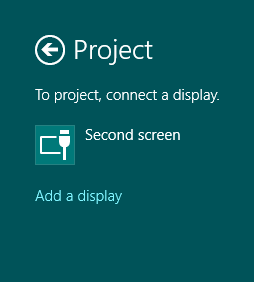 But the easier option is to open the Devices charm and select Project > Add a display. If there’s a Miracast display nearby, Windows 8 should find it. Windows 8.1 brings a bevy of improvements to the way it handles the more exotic printers popping up these days. For one thing, Windows 8.1 packs 3D printer support in the form of a driver and a native API, and hopefully—hopefully—that will make the 3D printing process as simple as the traditional 2D printing process, rather than the complicated export-filled mess that it is now. 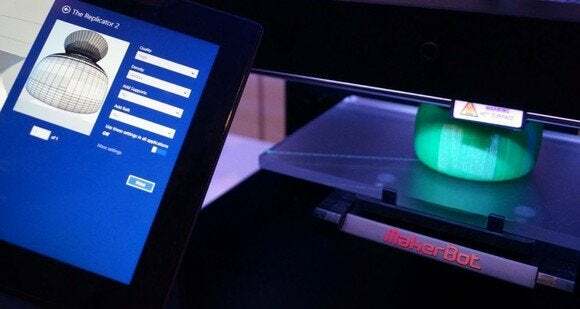 The idea is to allow you to kick 3D printers to life using the Print option under the Devices charm, so you can print from directly within that oh-so-fresh modern interface—assuming the printer’s software takes advantage of Microsoft’s support. Check out the image below to see Windows 8.1 printing to a MakerBot Replicator 2 3D printer. But the cutting-edge printing action doesn’t stop there. Windows 8.1 also includes support for NFC printers. If both your Windows device and your printer are members of the (currently rare) NFC-enabled breed, simply tapping one against the other can automatically pair the two devices for hassle-free printing action. And if NFC or 3D printers are just a bit too adventurous for you, you’ll be happy to hear that Windows 8.1 also includes Wi-Fi Direct printing capabilities. What does that mean? Simple: You can connect directly to a Wi-Fi Direct-enabled printer without having to jump on a Wi-Fi network or fuss with installing software, though the exact method will depend on your printer and device.